As the NHRA Full Throttle season heads to the SuperNationals at legendary Old Bridge Township Raceway Park in Englishtown, New Jersey, Pro Stock Motorcycle racer Jerry Savoie sits a surprising sixth in points. Surprising to everyone, perhaps, but Savoie. Savoie sat out of racing a whopping 30 years as he took care of family and business, then jumped back aboard with a Suzuki Hayabusa streetbike bought from his buddy Paul Miller. “I took it down the track and after the very first pass I thought to myself ‘Why haven’t I been doing this the last 30 years?’” Within weeks, Savoie ran into current Top Fuel and former Pro Stock Motorcycle racer Antron Brown at a wedding. Savoie mentioned that he was interested in getting a Pro Stock bike. Brown may not know much about alligator farming, but he can spot an eager fish when he has him hooked. “Why don’t you come up to Indy and see what Don Schumacher has for sale?” Brown told Savoie. By Wednesday, Savoie and Miller were in Indianapolis sizing up the equipment and bought everything in sight. Two weeks later he came back for the truck and trailer. After hiring veteran Suzuki tuner Mark Peiser, Savoie and his White Alligator Racing team qualified 7th the very first time out at Gainesville, just behind fellow Louisianan and current champ LE Tonglet. Savoie nailed an .008 light and won his very first round of competition, establishing himself and the WAR team as instant contenders. Savoie has qualified handily in the top 10 and lost only to the event winner in all three of his NHRA starts, taking the tree each and every time. 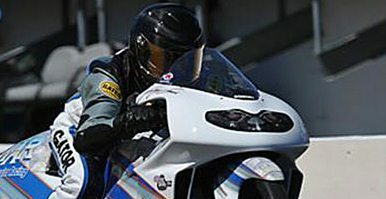 Pro Stock Motorcycle racers are already feeling the sharp teeth of Savoie and the White Alligator Racing Suzuki.